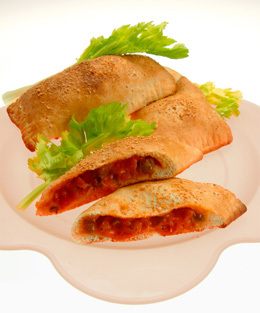 A larger version of this Italian recipe is often called a calzone. Vary the fillings to your family's liking and you will win raves at the table. Clean mushrooms with a damp paper towel or mushroom brush. On the cutting board with the sharp knife trim bottom of stems; coarsely chop the mushrooms to fill 1¼ cups (300 mL). Place the mushrooms, diced green pepper, bacon, pizza sauce and cheese in the bowl; stir to mix well. Preheat oven to 425ºF (220ºC). On a lightly floured counter or cutting board unroll the pizza dough according to package directions. Roll or press out to 12”(30 cm) x10” (25 cm) rectangle. With sharp knife cut into 4 equal pieces. Using a pastry brush moisten edges of each piece of dough with water. Mound ¼ of mixture onto half of each piece of dough leaving a ½”(1 cm) border. Pull and stretch the other half of dough over the filling and press edges firmly together. Lightly spray a large baking sheet with cooking spray and place pizza pockets about 2”(5 cm) apart on it. With the tines of a fork press edges firmly again to seal and prick a few holes in the top to allow steam to escape. Brush top of pockets with milk and sprinkle with Parmesan cheese. Place baking sheet in middle of oven and bake for 13 –15 min until lightly browned and crisp on top. Using oven mitts remove baking sheet from oven and place on cooling rack for 5 minutes. With sharp knife cut in half diagonally to serve if desired. Variations: Substitute broccoli for green pepper and ham for bacon.